55 high schoolers off-loaded a bus and have been practicing in the sanctuary for the last hour. Talk about sound!! They will sing in worship and present a concert at 7:00 pm tomorrow night at MCC. Mark 1:15 is Jesus' clarion call to get beyond ourselves and our blame game. He calls us to face the ashes of our own sinfulness and repent and believe the Gospel. For the past week I have been reflecting on the nature of gossip. I confessed to my role in gossip in a posting below. It is so easy to talk about a person rather than talk to him/her. The negative is so much juicier to discuss than the positive. Failings are much more interesting than successes. But in talking with others about the nature of gossip, one person suggested that a community that tolerates/encourages gossip is also encouraging mediocrity. When I pushed for clarification, she said that anyone who tries a new thing and fails, will be the target of gossip. If gossip is tolerated, the fragility of creativity is damaged and people do not exercise the freedom to try something new again because they know what will happen if they fail: gossip. So it's much safer to function within the group norms and expectations and not try something new. Where has your creativity been clipped by gossip from those around you? Where might your gossip hinder the creativity of those around you? The four churches of Monteciot (M-4) have been working all month on a project to rebuild decayed showers and restrooms for 153 people who live in vacation campers like the one below. Two 16 year old girls today told Martha that they were born in this park and have never NOT lived in a camper. 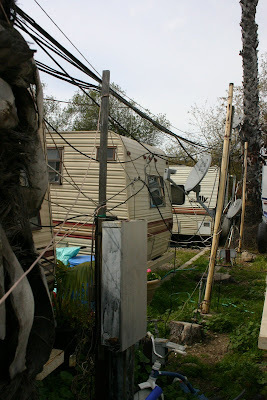 Behind the campers is a jumble of wires for everything, making it look like a third world back alley...except for one thing: it is safe and they have a sense of community and pride. These are the nursery and field workers, who pay $200-400 rent for campers like these, but also create a tight community of extra uncles and aunts who love them and care for each other. The iron-tough little manager (Betty) allows no drugs, prostitution or drinking outside. To thank us, People's Self-Help Housing and the residents provided a feast for members of the M-4 churches. Then the girls came out and gave us a wonderful thank-you dance. After the dance, the girls went among us giving us their "thank-you" necklaces they wore during the dance. I feel pretty rich today! 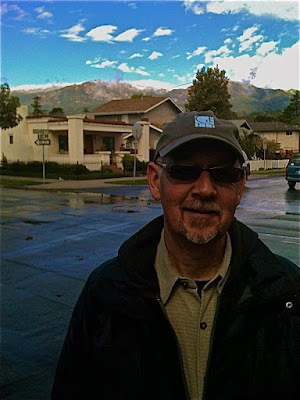 My good and deep friend Chris Brooks blogged today about discovering his identity. He tells the story of the African tradition of a newly pregnant woman going out into the forest with good friends till they discover the baby's "song." These friends, then, have a responsibility to remind that child of his/her "song." That article triggered waves of thoughts about finding one's "song." I remember a lecture at North Park Seminary by the late Eric Routley, a famous hymnologist, who found the Covenant's song in the hymnal by turning directly to "Children of the Heavenly Father" and telling us why this song defines us at our core. I recall another scholar, Paul Westermayer, from St. Olaf and Luther Theological Seminary, visiting with the music leadership in Minneapolis. He told us that each congregation has its own "voice" like each person does. Some are sopranos and others are baritones. The job of the pastor is to find and bless the "voice" of that congregation. The voice of Salem Covenant is a far different voice than that of Montecito Covenant, so is their song. Martha and I are voracious listeners of indy music. Some of it is odd, some distasteful and sometimes an artists song echoes in my heart. "That's it" I think..."They get it!" I never quite understood my strong affinity for artists like Suzanne Vega, Bjork, Sufjan Stevens, Knut Reiserud, Bach, or Over the Rhine until now. They are singing my song(s). Who knows and who sings your song? My blogs often come back to bite me. A couple of blogs down, I wrote about an awkward conversation at a wedding. I am tempted to remove the blog, but for transparency reasons I think it should be up for a while. A local guy invited me to lunch for a stimulating and encouraging conversation about life and ministry, church stories and faith in practice. Towards the end, he asked me if anyone at the table offended him. I was momentarily stunned and then recalled the blog and recounted as much of it as I could. He then told me that he had received the blog as had the guy I was talking to. My new friend was gracious as could be, but I felt guilty because he/they identified themselves in the blog with my critical words (interesting that my blog about criticism came off as critical itself). I had to apologize and ask for the other fellow's contact information, because I should have talked with him first instead of blasting out. 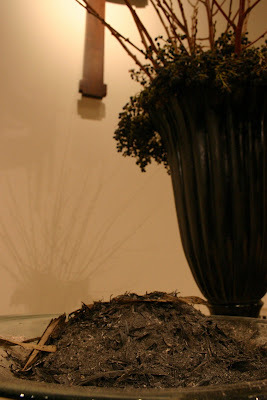 I guess this also comes at an opportune time: Ash Wednesday, when I will soon reflect on the meaning of ashes and impose them on worshipers as their act of confession. My lead is to confess to gossiping about a brother instead of talking with him directly. A blog can do that, overtly or inadvertently. I can skip the Matthew 18 process about talking with a brother (or sister) face to face and jump to the easier venue of talking about him/her/them in the abstract, making me look innocent and them bad. "Remember, you are dust, and to dust you shall return. Repent and believe the gospel." I love the worship team at Montecito Covenant Church. Each week we have a gathering of very talented people (young and old) who lead the congregation in worship. They are not up front performing, but helping the congregation enter into worship on the theme of the day. Between services last week, we were talking about a glitch in the system. One of the numbers had two verses on the power point and the team wanted to sing four, but the bulletin had only the two printed verses also (power-point and bulletins match up). One young woman asked, why do we need bulletins anyway? I answered that for shorter and younger people, who get blocked by those standing in front of them, it enables them to see, plus it is a good devotional aid to take home during the week, especially when some of the songs have really great and deep lyrics. Another leader (my age) gently told her about the generational divide where some of us "older types" like holding a bulletin and reading off of it and not looking up to the screen. This answer bewildered her a bit. Why read a bulletin when you can look up, hands free and sing? Then I realized that musical notation has no power for her (and many others). The words they love to sing, they memorize and can sing effortlessly with their eyes closed and hands raised in genuine prayer and praise. The thought of being chained to paper (or much less a heavy hymnal) is less than inspiring. Musicologically they learn by ear, memory, and repeating, not by reading. The question I asked my musician friend this morning is, how do you learn and take in new music? Where do you get new songs from? When I suggested the Bryan Jeffrey Leech song "Glimpses of Glory" for Transfiguration Sunday, none of the worship team had ever heard it and there were not mp3's of it that they could listen to. It's presence in the hymnal was not of real help. Then I realized the down-side of a memory-only song community. The songs they sing are limited to the known repertoire of the leadership at that time. Someone has to already know a song before it can be learned. Going to a hymnal (or sheet music) and sight-reading new songs does not work with the larger group. Our worship leader reads and composes music, so it works for him, but not the team. I wonder if a good project would not be the compiling of great songs and hymns into both an mp3 format that could be down-loaded and listened to and provided the notation and chords for those songs we want to stretch into? Would it require all new copyright stuff to add chords and digitize some of the great hymns in the Covenant hymnal? Is there conversation about a new, web-based way of sharing great worship music? Pastor for Gospel Action, Jon Lemmond, put together a "Ministry Fair" today composed of all those organizations MCC formally supports. He acknowledged them publicly in worship, prayed for them all and then together we read a litany of work/mission. Each group had their own table on the patio and I just came from visiting with them and watching them connect to our members who either support them already or who are interested. Great idea! How is this for a permanent home? An old vacation camper with a garden hose for water and no bathroom or shower. This is the normal (a bit dirtier because it is slated for removal) type of camper families of 5 live in year-round at the camper park where M-4 is remodeling the bathrooms and showers. 153 residents in 55 campers share a bathroom of three showers and three toilets. Our current housing crisis is indeed a problem, but when do these living conditions enter the equation? How do you see the Transfiguration of Jesus? Jesus in the center, bounded by Moses and Elijah? The mountaintop, covered over with a cloud? Bright clothing, radiated by God's presence? The voice calling out "This is my son, the Beloved, listen to him."? As I wrote below, visions have a powerfully sustaining power. A strong image carries us through tough times. What are your sustaining visions? How many of those visions are biblical visions? It's simply gorgeous! I'm sitting on my back patio in the late afternoon sun of Santa Barbara. It's been in the 70's all day. Now I hear the chirping of birds as sun spills through the oak trees and makes shadows on the whitewashed walls. There are fifty shades of green all around me set off by terra cotta tiles and ceramic pots. I'm a visual person. Most of us are. We take great care with how our personal spaces are designed and arranged. Some people focus on their houses, others their gardens. Some have their one, special room: garage, study, work-room. Still others maintain their car as their one personal space. One good friend's only real space is his laptop screen, that he guards and designs with infinite care. Since our teaching time at the Midwinter on altar-pieces, I've had a number of intriguing conversations with educated and thoughtful people who minimize space over sound. It's the Word; sung, read, spoken and shared that carries all the power, not the space. Religious space for them should be minimal, sparse and spare. The visual (except for video) is unnecessary, wasteful and distracting. It could be better employed in mission and ministry, not decoration and sight. Maybe that's the residue from our Reformation based anti-catholicism. When I speak of robes and stoles, some of these friends instinctively flinch. Maybe that's why the Transfiguration plays so poorly in the evangelical world (except for the command to "Listen to Him.") and so strongly in the Roman Catholic and Orthodox world. What do you see? What role does your seeing play in your believing, obeying and faithfulness to Jesus? How does seeing Moses and Elijah with Jesus help your faith? Do any visuals sustain your faith? Some time ago I blogged on the ever-presence of the cross in worship, as back-drops to most screen lyrics. Maybe our only visual is the cross. What does that say? Should we expand our visual repertoire beyond an empty cross? What will you see this Sunday as you worship? Where will there be signs and signals of transfiguration? Look, listen. I had a great lunch with someone from an international aid organization today. We talked at long length about the changing face of ministries; of trying to do more with less and seeking collaborative partnerships wherever we could. I talked about the joy of M-4 (the 4 churches of Montecito) and how I would never try to do something alone again when I could do it in partnership with other churches in the community. We are able to magnify impact, share resources and build loving cooperation. What's the down-side to this? Off-handedly (my typical approach) I asked if any denominational relief agencies have sought out conversations about "outsourcing" their world relief services to this larger organization? He paused and thought for a while. He was not able to thin of a single conversation that he knew about from denominations to his organization. That got me thinking about the Evangelical Covenant's World Relief Services. We are in the search process for a new director as Jim Sundholm is retiring. What about "not" replacing the position but ecumenically partnering Bread for the World, World Vision, Compassion International or any number of well-respected global relief groups? What would be the down-side to that? We could still request channeling contributions through Covenant churches when present, just like any individual donor would do? We could cut administrative costs and build better partnership. just a thought. Lake Wobegon's children are "all above average", meaning that everyone gets an "A". In conversations with teachers over the years, grade inflation is a sore spot. "A's" are expected and "B's" are awarded if you really mess up. "C's" and "D's"? Forget it. In the churches I've served there has been a pressing climate of achievement on young people from their parents and even peers to succeed at any cost. In Wednesday's New York Times there is a great article on "Student Expectations" that qualify a student for an "B." 30% of students expected a "B" for attending lectures and 40% expected a "B" for completing reading assignments. Students "often confuse the level of effort with the quality of work." Because they worked hard on a project, they believe they should get high marks, even if the project is flawed. What's happened over the years, according to the article, is that the academic burden has shifted from the student earning the grade to the teacher proving that the grade is accurate. As an adult, I see this atmosphere infect a lot of my peers. We show up, put in our time, get exhausted and expect rewards, without looking at results. Could this be what's happened in our financial community as well? Bonuses not based on real productive frutis? I received a text message from Isaac Saturday evening while we were attending a wedding reception. It said "She said yes" and with that Martha let out a whoop! and squeal of delight. We were aware of a fast-budding romance between Isaac and Anna, a former student of Martha's and semi-adopted daughter here in California. Anna spends most holidays with us, since she is only 3 hours north of us and her family is back in Minnesota. She has overlapped with our kids' visits many times, but this Thanksgiving only Isaac could come out with us and he and Anna had good time together. 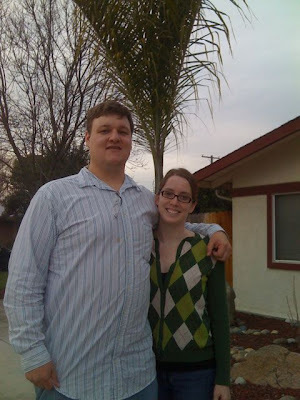 Well, without narrating too much, he asked her and she said yes, and we are on the way to another wedding in early May. Whew!! At a recent wedding reception we were seated at a table of couples we never met before. They had all known each other for years, some were in business together, others attended the same church, several were Westmont graduates. When I asked the guy I sat next to what church he called home in the community, he replied "Right now we are attending ______________" I know the pastor there, a good guy, solid faith, good church. Then the guy turned to me and asked "What's with your architecture? How come you built so small? Why don't you do more for college ministries? I would think that you'd have a college ministry of hundreds. You know why we don't attend your church?..." Then he listed a number of good reasons why he and his wife do not attend MCC. At each critique, I thought "He's right. I could be more_________, or we could improve ____________ or have a better _________." Needless to say, when the dancing began, we were glad to leave. The conversation was so withering, I have actually forgotten his name. Then today after church, one of our members came up and related a story to me. He was at a recent meeting for the Covenant. One of the leaders on his particular committee heard that my father is Norbert Johnson. He stopped the meeting and with great emotion told the entire gathering how during his high school years, my dad led him to Christ at a camp. Now he is a leading voice in denominational finance and strategic thinking. How do the two stories relate? My dad was never snappy, hip or cool. But he knew who he was and where he was going. He was like the boat compass above. He was fixed to the ship and knew where North was. My dad knows his Bible and he knows what is important for the long haul. And keeping demanding customers happy was never one of those things. Oh, I guess he'd listen to a guy like I was with courteously and even reflectively, but then he'd get back to preaching, teaching, and leading hungry people to Jesus. Keep me focussed North. Today my office got tee-peed! I guess I deserved it. My son Isaac gave me an "annoyatron" for Christmas. It's a wonderful little device that emits random, irritating, high-pitched noises. When placed behind books on a bookshelf, it's impossible to find because you never know when it's going off. Most folks figure something is melting down in their computer or sound system is crashing. It's a great toy! This morning I placed it in the youth office. 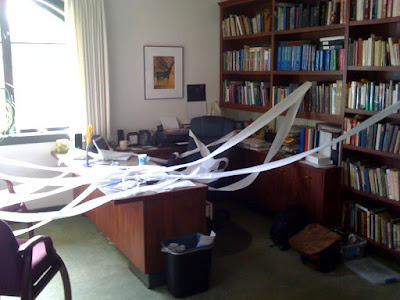 They figured out who did it, but couldn't find it and abandoned the office....visiting my office with a roll of toilet paper. Touche! Who are the lepers Jesus would heal today? With Multi-Drug Regimens (MDR) leprosy is fairly easily treated. So who are the incurable, hopeless lepers today? I guess it would be those that have barbed wire around them. Those who are fenced off, out, away and invisible. The text for Sunday is Mark 1:40-49. Who are the lepers? 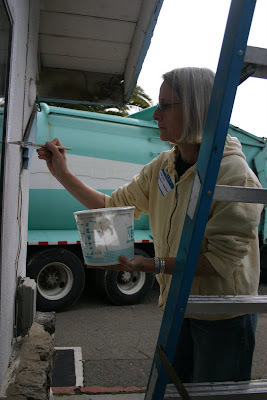 A bright sky was welcomed by the 15-20 M-4 (the 4 churches of Montecito) volunteers who gathered again this Saturday at the Carpinteria Camper Park to continue demo-ing the men's and women's restrooms/showers. The women's room was completely gutted and refitted with new toilets and a new layer of paint before installing new shower privacy partitions. Another crew was at work tearing out the old fixtures and partitions in the men's side. An additional project was repainting the basketball court and getting a new roof on the whole shower/restroom building. There was such a good buzz from the participants. The residents too greeted me with "hello's" and broad smiles as I roamed around with my camera. It rained and poured all morning. I planned to go for a lunch walk with a guy from church even in the rain. So we headed off in a downpour, the temperature was a brutal 45 degrees!! We had a great bowl of soup at a new restaurant and the rain stopped, so we headed off for a good walk and talk. When we turned to head back, I looked up and saw the tops of the hills covered with a dusting of snow. The cooler lower temperatures meant that the upper elevation of 3-4,000 must have been below freezing and hence the snow. Pretty cool! On Sunday night our Bible Study group prayed for a friend of one of our members. Philip Rizk, whose mother is German and father is Egyptian and who is a graduate of Wheaton College, was arrested by the Egyptian police and held in secret isolation for several days. Why? Philip was part of a peaceful protest group advocating for the human rights of Palestinians as an Egyptian citizen. After one protest march, he was arrested and taken away. All around the world people began praying for release. Today it happened! 8.Sarchasm: The gulf between the author of sarcastic wit and the person who doesn't get it. 11. Karmageddon: It's like, when everybody is sending off all these really bad vibes, right? And then, like, the Earth explodes and it's, like, a serious bummer. I don't know who you are, in fact nobody I've asked knows who you are, but I've missed you and glad you are back. You are the persons who make Covenant Blogs a great place to go and skim the various Covenant bloggers. I'm glad to be adding you back to may daily routine. Thanks for all that you do!! The Big Show or the Family? I had dinner with a good friend of mine recently. It was one of those relaxing dinners where the conversation was not restricted to the safe and casual, but probed deeply and thoughtfully into areas that are often off-limits, like politics, money, relationships and religion. I asked if he and his wife were still going to the church they have attended for years. He sat back and winced. "No" he said "we don't go there anymore. We are put off by the big show." Now if anyone else used that term for worship, I would react negatively and remind them that worship is not a show. But my friend has unusual credentials to speak, being a former pastor and actively involved in several large churches. His comment reminded me of another comment voiced by a pastor in a gathering some years ago when he said "It's all about the weekend." For this pastor, all his time and energies, his staff investment led to and peaked at the weekend worship services; the big show. I am writing this between worship services today. I do not denigrate the importance and value of Sunday worship. I invest great amounts of time and energy into worship preparation (especially the sermon). But it's not the "big show." It's the gathering of the family of God, with all sorts of weird aunts and uncles I haven't met yet, grumpy old grandparents and fussy babies. It's about hanging out with people I genuinely love and who genuinely love each other. It's about making space in a pew for a newcomer and asking them their name and introducing them to me later. It's about devotion to the Word and the words, the table and the font. What's your worship like today? The big show or the family gathering? Did you go or have you checked out? Disciple-making is something both taught and caught. Jesus explicitly teaches us about a number of things on being a disciple (Sermon on the Mount, forgiveness, healing, etc). But some things we learn by just observing what Jesus does on his own time; like prayer. Mark 1:29-39 is a great text that illustrates Jesus' deep hunger to get alone and be with his Father. You Think You Have Big Waves? When Martha and I got back from the M-4 project, we noticed the parking lot was full of people as was the gym. When I poked my head inside, there was a pee-wee basketball tournament going on. The YMCA asked if we could be their back-up site in case of rain (2.5 inches and continuing). The families were having so much fun! A couple of dads thanked me (MCC) for opening the gym to the community like this. It's what community presence is all about. On a cold and rainy day, M-4 volunteers gathered at the Carpinteria Camper Park for our latest project: rebuilding the two restrooms and showers for the 153 residents. It was a bit chaotic because everyone wanted to be out of the rain and the two restrooms, as you can see, are not very large. A devoted crew of laborers were dismantling the rooms when we arrived. But an emergency arose while were were hanging around. An old camper was leaking like a sieve. This camper was home to a family of five. They needed to be immediately relocated to a dry trailer. The manager invited me inside, but I did not have the heart to take pictures there...it seemed too invasive. The sky-light/vent was pouring water into the camper's back-bedroom. It was wet and cold and the family needed to be moved right now! 1. The worship team under Matt Nightengale, Randall Wilkens and Joseph Rasheed (and Katie Martinez) was over-the-top for creativity. They had a banner over them that said "YES". They gave us permission to sing such a wide range of musical styles with a freedom to move or not move, that all revolved intimately with the theme of the speakers. It really helped that I became a friend of Joseph Rasheed from Texas. He is a man you need to meet and have lead you in worship! 2. The morning teachings by Klyne Snodgrass were classic depth and meat for the hungry pastor. He took the theme "Centrality of the Word" and broke it into three imperative verbs: eat it, hear it, see it. And if you know Klyne, sniffing cold and all, he kept pushing us deeper and deeper into the text. 3. The evening speakers were great too: Judy Peterson and Efrem Smith. I know and like Efrem so much, it was cool to see him push us Covenanters to be as Covenant as he is. When he preaches, things smoke! Phyllis Tickle was new to me, and an intellectual delight with her concept of a "rummage sale in the church every 500 years". While not all historians agree with her paradigm, it was an intriguing lens through which to see our current upheavals. Then Gary Walters' sermon on Thursday night was a calm call to faithfulness, to be the cloud bringing rain to a dry land. I am excited by the quiet intensity that comes with Gary as our new president. 4. Jeanne Heckman joined Martha and me for the pre-Midwinter workshop on worship and how we do sacred space. Her comment was enlightening. She thought she was going to a conference of old Swedish white guys, and was overwhelmed by the color and diversity everywhere she went. This is the lab of the Covenant. You get a chance to see the emerging energy and diversity jammed into one hotel. 5. Then it was the relationship building. I got to sit with my brother Tim for many of the sessions. We don't do that except here once a year. For many pastors this is the only time to hang out with their oldest and best friends, sometimes brother to brother or father and son (Luke stayed with me and we watched some action movies together). The result? I feel filled up and ready to go. Bring it on! The A380's upper deck extends along almost the entire length of the fuselage, and its width is equivalent to that of a widebody aircraft. This allows for a cabin with 50% more floor space than the next-largest airliner, the Boeing 747-400. and provides seating for 525 people in standard three-class configuration or up to 853 people in all economy class configurations. The A380 is offered in passenger and freighter versions. The A380-800, the passenger model, is the largest passenger airliner in the world, but has a shorter fuselage than the Airbus A340-600, which is Airbus's next-biggest passenger aeroplane. The A380-800F, the freighter model, is offered as one of the largest freight aircraft, with a listed payload capacity exceeded only by the Antonov An-225. The A380-800 has a design range of 15,200 km (8,200 nmi), sufficient to fly from Boston to Hong Kong for example, and a cruising speed of Mach 0.85 (about 900 km/h or 560 mph at cruising altitude). It is the first commercial jet capable of using GTL-based fuel. My trip home yesterday from Chicago impressed my eyes. From the vantage point of 30,000 feet I saw the developing contours of our great land, starting with the vast, frozen farmlands of the midwest below. The pilot announced that we were coming upon the Rocky Mountains that rise up like a wall at the edge of the flat plains. After the mountains we flew over vast areas of brown wilderness, etched with deep valleys and canyons. But the greatest view for me was the snaking, silver river in the Grand Canyon, carving deep ruts in the earth. Wow, what a country we have, and I flew over it in a few hours. What a gift! How are you enjoying the Midwinter? How are the classes? What are you doing? The truth of the picture above tells it all. It's about meeting and gathering with old friends and making new ones. I have deeply appreciated the morning bible studies by Klyne Snodgrass on "Eating, Hearing, and Seeing the Word" and the powerful evening services of great music and preaching by Judy Peterson, Efrem Smith, and Phyllis Tickle. My main job here is auspicious: turn the candles on at the beginning of the service and turn them off at the end. 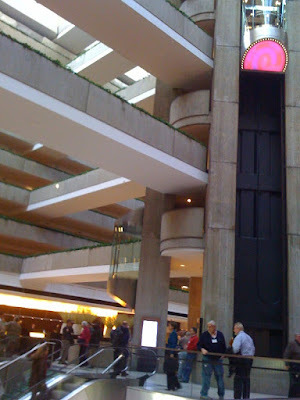 The big value comes from these lobby conversations with director of Communications Don Meyer, Spiritual Formation's Marti Burger, my successor in Minneapolis Mark Pattie, former staff members from Salem, Muskegon, and Lafaeytte. It's about meeting with missionaries like Galen Johnson and Ken Satterberg or conference leaders like Evelyn Johnson, Walter Contrares, and Wayne Carlson. I had time with my executive coach Alan Forsman. But the best time of all was that spent with Luke and my brother Tim; watching movies, eating meals and drinking coffee. By this time in the week, I'm almost talked out. I've used up almost all my words in my head. I'm ready for my own pulpit, office, bed and chairs at home. The Midwinter reminds me of the privilege of being in ministry, serving a church I love and who loves me, a denomination that is driven by a desire to obey the word and love our neighbors. I stopped seeing crosses years ago. Crosses are everywhere in my world: on the walls of the sanctuaries, entry-ways, steeples, paintings, jewelry, license-plate covers, Bible covers, etc. You name the place, I've seen crosses there, as witnesses and reminders, as identifiers and sources of comfort. We have hymns, chorusses and songs about crosses. But three years ago a missionary in France working with displaced African Muslims told me how crosses just don't work in the Muslim community. They speak of the Crusades and conquering, of warfare and tension, not reconciliation. He told me how in current Muslim/Christian conflicts, when "christians" win a battle and burn a town, they plant a cross in the ashes. It happened in Serbia and Kosovo. So he uses the fish and sun, wheat and rock. There are so many great images upon which to view our faith. Then I began seeing and looking for the resurrection, empty tomb images. Where are they? Where are the images, not of death, but of new life and hope. I know the protestant argument that we don't have a crucifix with Christ still hanging in death, but an empty cross after the resurrection. But it is still a portion of our atonement and hope. This all comes to mind today in our worship gathering at the Midwinter. The music is exceptional and full of life and energy, hope and healing. But the backdrops to so many of the lyrics are crosses, crosses everywhere. Are there other good graphics to use among the crosses? Is that heretical? Do we need more imagery behind our lyrics, especially imagery that is appropriate to the words being sung? Oh, I still love the cross and the story of Jesus death for me. There can be no holy week without the cross of Good Friday...but that's not where the story ends. I met him in Lafayette, Indiana at an ecumenical pastors' lunch. Tall, lanky and folksy, Millard Fuller did not cut an impressive first glance. He looked like a rumpled shoe salesman...until he talked with heart-felt passion about the fundamental need/right for housing. The founder of Habitat For Humanity died yesterday at age 74. Peace to his memory. On the front page of today's New York Times Edmund Andrews and Vikas Bajajwrite an insightful piece about the push-back in executive suites about limiting CEO pay to just above what we pay the President of the USA. According to the article, the Congressional Bail-Out packages will include stipulations that CEO's and upper management cannot receive more than $500,000 per year. James Reda, founder and director of James F. Reda and Associates, a compensation and consulting firm said "That is pretty draconian, $500,000 is not a lot of money, particularly if there is no bonus." What planet does he live on? I took 500,000 and divided it into 52 weekly payments and came up with a nice, every Friday check of $9,615.38. I do not consider that "not a lot of money!" I particularly like the pay limitation clause that keeps executive pay of those failing institutions close to what we pay the most important person in the USA, if not the world. If a company is going to get my money, tax-payer generated money, then they must play by our rules; reasonable compensation. The theme for the Midwinter “The Centrality of the Word” had some recognizable visuals we could use. The Bible is placed centrally and draped with a prayer shawl (Christ as the fulfillment of the Law). The prayer shawl is placed on the Bible as the Word made flesh. The use of the vine comes from John 15:1-4, which includes a reference in verse 3 to being cleansed by the Word. The earthen vessel references what we are shaped as, a people shaped by the Word. Clay appears again as earth and spittle, what Christ used to heal the deaf and restore hearing (while Christ used spittle again to restore sight). 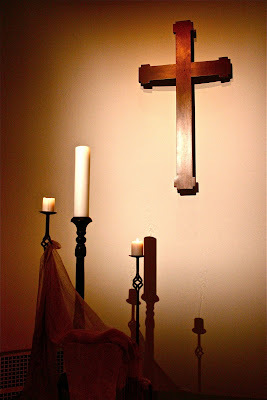 The tall Christ candle dominates while the very earthy cloth, a Congo naturally dyed fiber piece, anchors it all. In conversations with my son Isaac last week, we kept returning to his question "What do you think is going to be the next BIG thing?" We put no restrictions on the answer; either negative or positive, technological or political, cultural or ecological. The I read Thomas Freidman's op ed article in Sunday's NYT's and it hit home. The next big thing is two things: 1. no magic bullet and 2. chronic and systemic loss of trust. It echoed the new realities on the ground that what we are dealing with and living with will not go away with the latest congressional bailout or newest leader. Barak Obama is telling that. Get used to a long road back. How long is long? There is no discernable light at the end of several quarters or even years. But the trust-loss issue hits home harder. Bernie Madoff is the poster child for those we thought we could trust who let us down. As spiritual leaders and pastors, that is the new given reality we must embrace without being turned cynical. Our congregations do not immediately trust us. In fact, their first response is to be suspcious, or at least to suspend judgement until we prove ourselves trustworthy. Take these two Big Things and work them out in your context. What does it look like?